My youngest daughter recently had her birthday. After tossing about party themes for a few weeks prior, she came home from school one day and told me she wanted a “Save the Earth” birthday party. Her kindergarten class had been doing a lot of earth-friendly activities in the days leading up to Earth Day this year. She was inspired and she wanted to do a few activities for kids who want to save the earth. She had a few friends over for her birthday and we planted seeds, made bird feeders from recycled materials, had a recycling relay race, and tried to be very conscious of our waste (i.e. no fancy decorations or little plastic toys). The kids had a ton of fun. Ever since then, she’s become my tiny earth warrior. She’s interested in learning all about saving the earth. I’ve been looking for fun ideas to help her learn all she can. 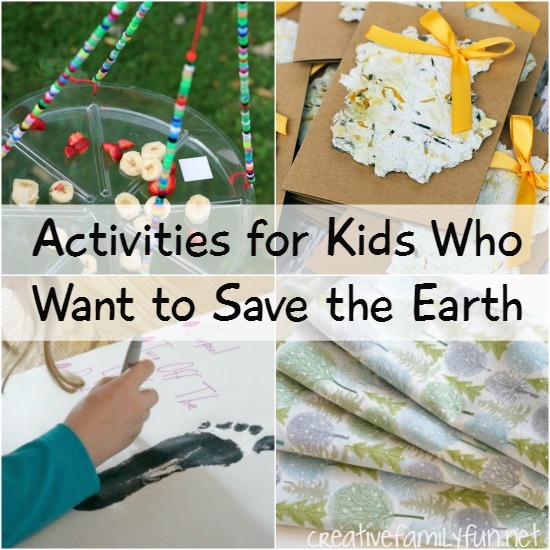 I’ve rounded up some fun activities for kids who want to save the earth. 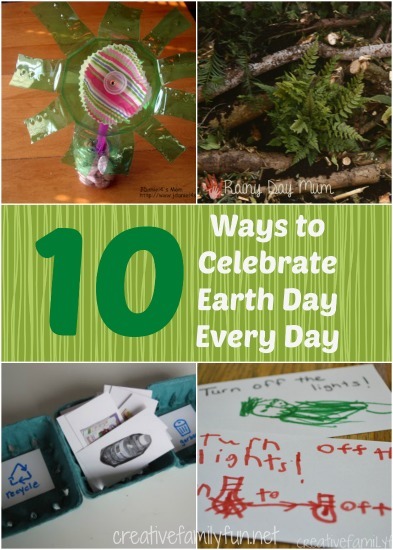 These ideas are perfect for Earth Day or any day. Have a day of service and clean up your neighborhood with What’s Up Fagans? It’s such a simple idea, but a very effective one. This would be a great idea for a group activity. Create and decorate recycling sorting bins with Every Star is Different. You have to scroll down to the end of the post for instructions. While you’re there, check out all the other fun activities! Learn about ways to conserve water with KCEdventures. Read some books, come up with ideas and put them into practice. Speaking of water, what is water pollution and how can you prevent it? Find out with these fun activities from One Time Through. What is a carbon footprint? 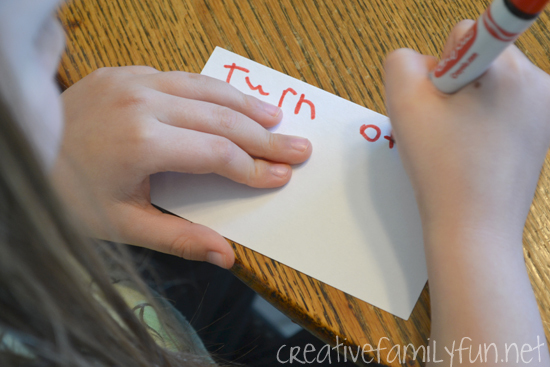 Find out with this fun activity from Kitchen Counter Chronicles. Switch from paper to cloth. Kitchen Counter Chronicles has an easy tutorial for making cloth napkins. Help your beginning sewer make a set, or let the kids be in charge of choosing the fabric. Attract butterflies to your yard. Plant some of these plants recommended by The Garden Glove. Or, make a DIY butterfly feeder like this one from Reading Confetti. Grow your own food. 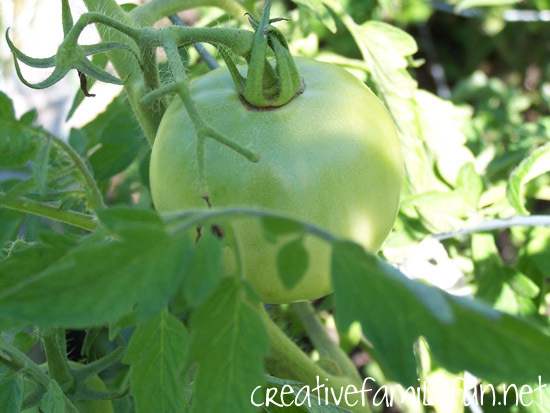 Try one of the quick-growing vegetables in this post from Rainy Day Mum. Feed the birds. Create a bird feeder from a recycled milk carton like this one from Red Ted Art. Or you can make a simple bird feeder from pine cones like these from Juggling With Kids. Upcycle! Use materials from the recycle bin to make crafts. Here are some of our favorite craft supplies from the recycle bin. Make and give a gift that helps the earth. Everyone would love to get one of these recycled paper seed cards from Fireflies and Mud Pies. Which one of these activities would your kids love to do? 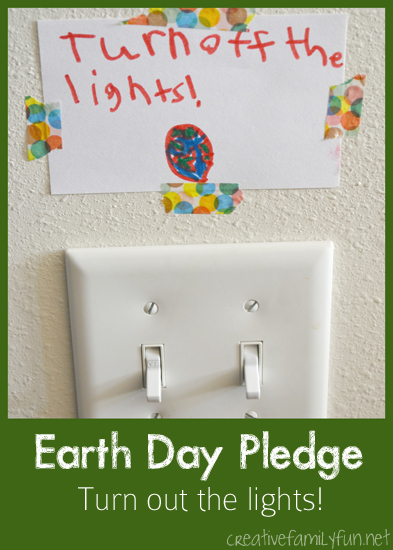 Earth Day Pledge – Turn Off the Lights! Earth Day may be only one day a year, but, it can (and should) be practiced every day. You can’t be too young to learn about the earth and find ways to help. 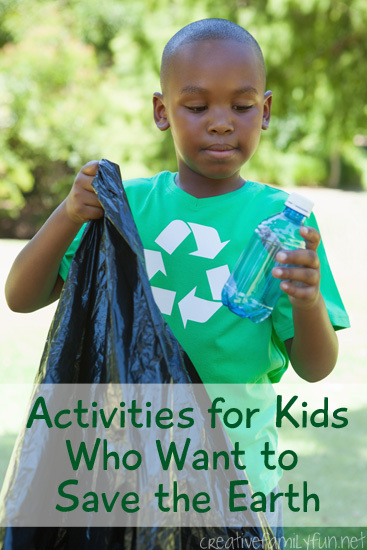 Your littlest ones can go on a nature walk or create a craft from the recycle bin. Older kids can take control and guide the family in ways to recycle, reduce, and reuse. They can implement a plan to reduce their water consumption or make a pledge to turn off the lights. 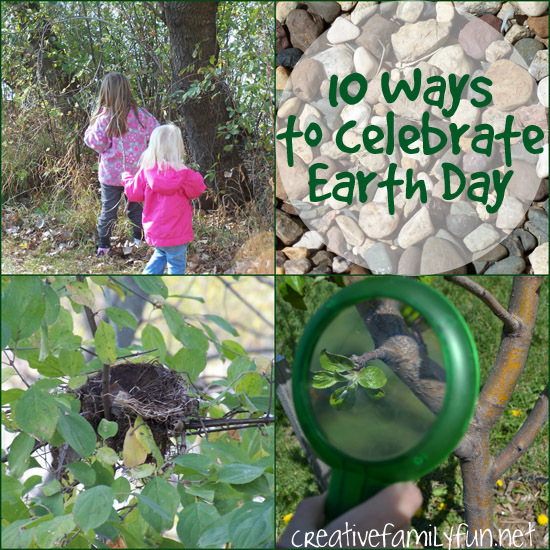 Here are 10 ideas for families that want to celebrate Earth Day every day. Set up an at-home recycling station. Teach Me Mommy show you how. Learn about the world around you and go on a nature walk with How Wee Learn. Pick up litter around your neighborhood with My Nearest and Dearest. Learn about composting and start a compost pile or bin in your yard with ALLterNATIVE Learning. Find ways to conserve water in your home with Kitchen Counter Chronicles. Play a recycling think and sort game with No Time for Flashcards. Make a log pile home for creatures in the corner of your yard with Rainy Day Mum. Search your recycling bin for craft supplies. JDaniel4’s mom has a great list of recycled crafts! 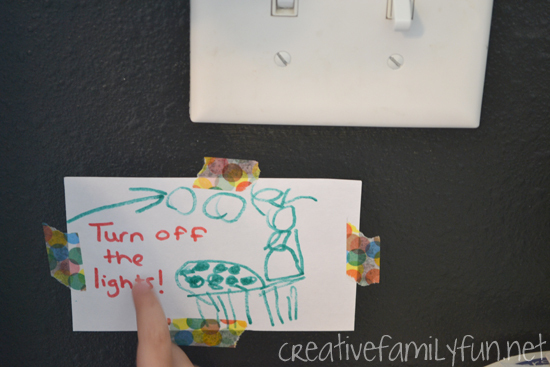 Challenge each other to turn out the lights, like we did here at Creative Family Fun. Save a tree with these 7 Ways Kids Can Help Save Trees from Go Explore Nature. What are some of the ways your family celebrates Earth Day every day? Make this a family adventure! Earth Day Pledge ~ Turn Off the Lights! I love Earth Day. It’s a great time to evaluate what you are already doing to conserve and find ways to make more of an impact. We already recycle and compost. We’ve planted several new trees. We use cloth napkins and use environmentally-safe cleaners. But, there was one big thing that we could do better. It was one thing that the girls could do themselves and feel like they were making a big difference. It was so simple. We need to turn out the lights! According to the Midwest Energy Efficiency Alliance (MEAA), artificial lighting is responsible for 20% of a home’s energy usage. Wow! We can easily reduce that percentage by turning off the lights when we leave a room and using natural light during the daytime. The girls were very excited about this idea and wanted to help, but we knew we needed a few reminders. We grabbed a few blank index cards, markers, and tape. 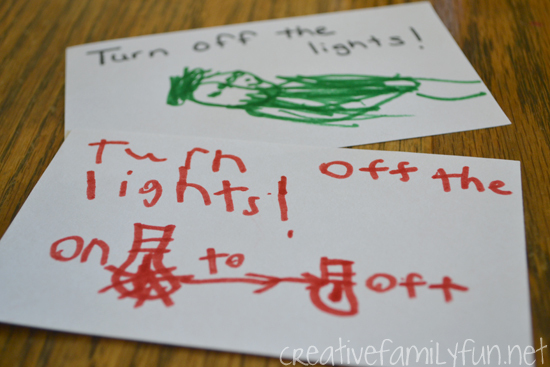 The girls made several “turn off the lights” signs, which were the perfect size to hang over (or under) our light switches. We traveled through the house and hung up the signs in the rooms where we always forget to turn off the lights, especially in the bathrooms and the girls’ bedroom. So far, the reminders have been working wonderfully. I’ve been hearing my girls’ verbal reminders to each other, “hey, you forgot to turn out the lights!” And, those switches have been flipped to “off” more times than not. Earth Day may come only once a year, but you can put into practice earth-friendly habits any day of the year. You’re never too young and you’re never too old. Show your kids just how simple it is to make a difference and see how they take charge. Hey, all it takes is turning off the lights! >Planning time: 10 minutes. It would be incredibly valuable to have a few statistics and facts on hand to share with the family. The U.S. Energy Information Administration’s Energy Kids website is a fabulous resource. Ages: 5 and up. Everyone of every age can benefit in picking up the habit of turning out the lights, but your kids 5 and up with find the information the most valuable. Time needed: 30 minutes. Give yourself plenty of time to talk and brainstorm. Maybe this simple idea will lead to more conversation about other things you can do as a family to be more eco-friendly! Earth Day is coming up on April 22. It’s a day to celebrate the Earth and what it provides us. We can also learn how we can help protect the Earth for ourselves, our children, and many generations to come. So what can you do? Any little act can go a long way and once these little acts become habit, they become bigger acts. Here are 10 ideas to celebrate Earth day. 1. Plant a tree. Plant a new tree in your yard, or if you don’t have a spot for a tree, you can have the National Arbor Day foundation plant one in a forest on your behalf. 2. Go on a hike and celebrate the beauty that the Earth provides you everyday. Here are some tips for hiking with children to help you enjoy the process. 3. Learn about composting and set up a compost bin. KidWorldCitizen has some great information to get you started, plus fun information to help teach your kids all about composting. You can also check out HowToCompost.org or the EPA’s information about composting at home. It will help reduce waste in our landfills and if you decide to do #7, you’ll have some fantastic free fertilizer to help those plants grow. 4. Brainstorm ways that your family can do more in helping the Earth. Do you need to turn off the lights more often? Can you recycle more? Can you replace paper items with cloth, such as napkins? 5. Observe wildlife. Learn about what animals need from us to live and remain in their environment. Can we do more to help them? You are never to old or too young to enjoy observing wildlife. It can be something as simple as watching a backyard bird feeder out your window. 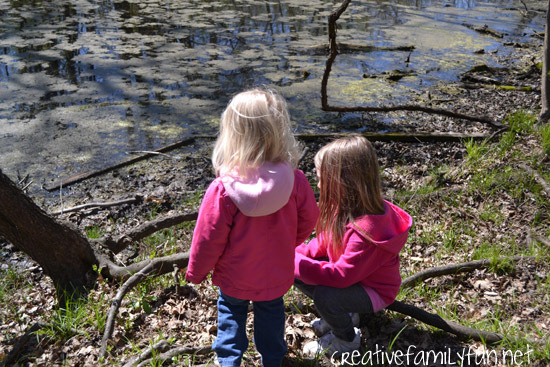 Here are a few tips to help you teach your young children how to observe nature. 6. Save up your pocket change or donate some of your allowance and send a donation to an organization that helps protect the Earth and the creatures that call it home. The World Wildlife Fund, the National Arbor Day Foundation, and The National Audobon Society are some possible organizations. 7. Plant a garden. Try to grow your own vegetables this year. Not only will you be eating healthier, but you’ll be reducing your carbon footprint. If you don’t have room for a garden, grow some potted herbs on your windowsill. And if you really don’t have a green thumb, vow to shop at your local farmer’s market more this year. There really is nothing better than garden-fresh vegetables. 8. Clean up your neighborhood, or a park. Take a walk through the neighborhood and pick up trash. Or, clean up a local park. Believe me, your neighbors will appreciate it, and who knows, maybe you’ll inspire someone else to do their part. 9. Go on a microsafari in your own yard. You will be amazed to discover everything that is growing in your yard. Grab your magnifying glass and get up close and personal with your yard. 10. Remake, reimagine, recycle. Is there something heading to the trash that you can remake into something else? Turn old jeans into fun aprons like these from Happy Hooligans. Or, you can turn old tank tops into reusable market bags, like these from Making Lemonade. What else can you remake? The best part about these ideas is that they’re not just for Earth Day. You can do them any day of year. So why not make Earth Day everyday? What are some ideas you would add to the list? Books are one of the first things I reach for when I want to teach my girls about something. So, when it came time to start talking about Earth Day, I went to the library. These books are all appropriate for preschoolers, plus older kids will enjoy them too. When searching for Earth Day books, choose ones about recycling, planting, trees, gardening, energy reduction, or the climate. 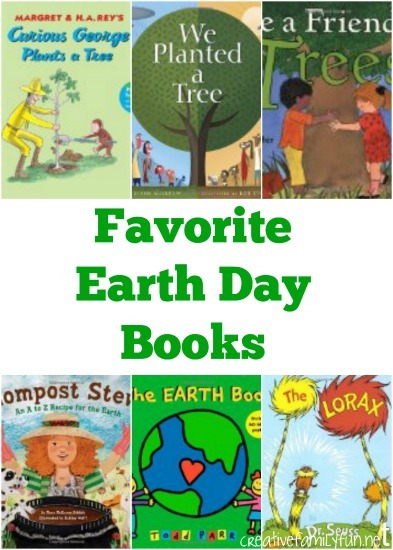 Do you have any favorite books about Earth Day? by Margret & H.A. Rey: George learns about the environment and wants to do something to help, so he decides to plant a tree. by Patricia Lauber: Learn about the importance of trees and how we can be a friend to trees. by Diane Muldrow: Learn about the benefits of trees through two families who plant two trees in different corners of the world. Compost Stew: An A to Z Recipe for the Earth by Mary McKenna Siddals: Learn all about compost through fun rhyming verse. The EARTH Book by Todd Parr: Colorful illustrations and playful text help explain the environment to young children.